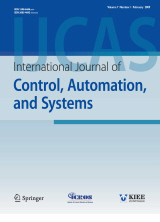 Abstract : "n this paper, a consecutive synchronization scheme is investigated to synchronize the nodes of a delayed complex dynamical network with an isolated node via an adaptive control approach. The specific feature of this scheme consists in the structure of the communication links: a communication connection is required between the node and one selected node in the network, and further communication links exist between any node and one neighbor node. In this way, all nodes are connected together like a chain. Based on Lyapunov-Krasovskii theory, some conditions are obtained in the form of linear matrix inequalities to guarantee the consecutive synchronization by the designed distributed adaptive control. To make this synchronization scheme more practical, no constraints have been considered for coupling connection matrix such as being symmetric or zero row sum. Finally, a numerical example is presented to demonstrate the effectiveness of the proposed method." Keyword : "Complex dynamical network, distributed adaptive control, Lyapunov-Krasovskii theory, synchronization, time-delay. "